more than twice the amount of EPA (18%) as compared to salmon oil (only 8%). Has Vitamin E in it. Studies have shown when dogs are given fish oil as a supplement (though very good for them) it has been shown that it may lower the dogs natural Vitamin E level. So by supplementing with Vitamin E it reduces the possibilities. Sea Pet Omega 3 Fish Oil "200" with Natural Vitamin E provides the biologically-available forms of the omega 3 essential fatty acids with 200 IUs of natural vitamin E per teaspoon. There are approximately 48 teaspoons in an 8 fl oz bottle. 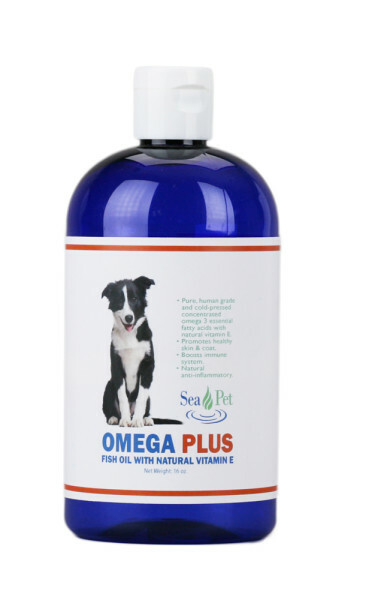 Sea Pet Omega 3 Fish Oil provides pure, medicinal grade Omega 3 essential fatty acids from molecularly distilled, cold-processed fish oils - (sardines and/or anchovies). Omega 3 fish oils are naturally in the form of EPA (Eicosapentaenoic Acid) and DHA (Docosahexaenoic Acid). are naturally in the biologically available forms of EPA (Eicosapentaenoic Acid) and DHA (Docosahexaenoic Acid). are the only forms of omega-3 essential fatty acids that are recommended more than twice the amount of EPA (with 18%) as compared to salmon oil (which has only 8%). contains 200 IUs (134mg) of natural vitamin E per teaspoon as a powerful antioxidant. is completely tested for heavy metals (lead, arsenic, mercury, cadmium), PCBs, dioxin and other toxins – surpassing all national and international standards for purity. is bottle filled with nitrogen during the filling process to prevent oxidation, to extend shelf life and to ensure freshness. provides 775 mg of EPA, 520 mg DHA and 200 IUs (134mg) of natural form vitamin E with each teaspoon. No conversion is needed when using Omega 3 fatty acids from fish oils. The Omega 3 oil from plant sources, such as flaxseed, is in the form of Alpha-linolenic Acid (LNA). LNA needs to be converted to EPA and DHA in order to be utilized by your pet. This conversion, however, is extremely inefficient -- 10 grams of LNA are required to convert to just one gram of EPA. Plant sources of Omega 3 are an extremely inefficient means for your pet to receive the essential fatty acids that they need. Essential Fatty Acids, such as EPA & DHA, serve a number of major vital functions in the body. They are required for the transport and metabolism of both cholesterol and triglycerides. They are required for normal brain development and brain function. They are required in visual function (retina), brain and nerve function (synapses), and adrenal function. They are required in the structure of the membranes that surround each cell in our body. They stimulate metabolism, increase metabolic rate, increase oxygen uptake, and increase energy production. They slow down growth of cancer cells. DHA(from fish oil) has been shown to be a key in neural development. Research, unveiled at the 2004 American Veterinary Medical Association convention, examined the role DHA (a long-chain omega-3 polyunsaturated fatty acid) - plays in puppies' neural development. The research shows "that puppies nourished with enhanced (high) levels of dietary docosahexaenoic acid (DHA) were smarter, more trainable than typical-DHA (low-DHA) nourished puppies." DHA is one of the most abundant fatty acids in the brain, and thought to be vital for mental function. DHA has long been praised as a wonder nutrient for human infants and now it's been found to boost healthy brain development in puppies. DHA, and its companion, EPA, are the forms of omega-3 essential fatty acids naturally available in fish oils -- for optimum utilization. Vegetable oils, such as flaxseed, provide a different form of omega 3 (alpha-linolenic acid) - not DHA. "Findings from the research indicate dietary DHA level is a key determinant of success, with the performance of the enhanced-DHA puppies being superior in the maze testing, compared with the typical-DHA nourished puppies, and ... demonstrated superior memories and a higher receptivity to training, confirming the importance of DHA in healthy brain development." Your dogs want to learn and to please you. And you can help them to better understand and learn what you are teaching! You will all be so much happier. Younger dogs or older dogs, active dogs or less active dogs -- it is never too late to supplement your pets with omega-3 essential fatty acids. New research shows that EPA (from fish oil) can reduce the activity of one of the major enzymes (aggrecanase) that has been shown to erode joint cartilage. By decreasing the activity of this enzyme Sea Pet Gold can help to restore your pet's joint health and mobility -- providing your pet with more ease of joint movement. EPA also converts to series 3 prostaglandins, which have many benefits. They regulate inflammatory responses (Skin and Joint). They regulate immune function, which can help in fighting disease more effectively. They regulate platelet stickiness. They regulate arterial muscle tone, which involves blood pressure regulation. It is the amount of EPA and DHA that benefits your pets - not just the amount of omega 3 ! LOOK FOR THE EPA AND DHA CONTENT. Note: If your dog is scheduled for surgery, eliminate the essential fatty acid supplements (flaxseed oil or fish body oil) at least 10 days before the surgery. The omega-3 EFAs in these oils do reduce blood coagulation, and thus increase bleeding. Results are normally seen within 2-3 weeks. After 4-5 weeks we suggest that you may gradually reduce down to the maintenance level for the continued well being of your pet.